_The award for best UK Supplier of the Year at The Ocean Awards was open to any British suppliers who could meet the criteria of being a seafood supplier that has shown the most consistent, well-communicated and far-reaching commitment to sustainable sourcing. The winner was Kernowsashimi. 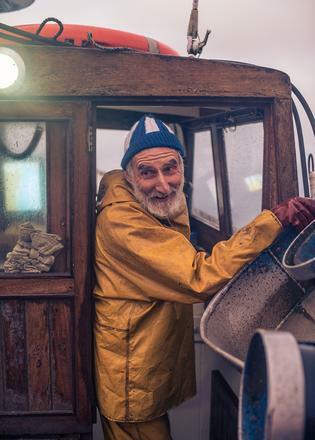 _ Cornish fisherman Chris Bean was 11 when he built his first boat and decided to go to sea. The son of a cabinetmaker (who helped him draw up the plans), he used to sail it up the Helford River, catching bass and bream. He soon realised there was money to be made from selling his catch to a local fishmonger – “more than from picking potatoes or turnips on a local farm,” he says – and throughout his adolescence this was how he earned his pocket money. He then made a career out of it and, more than 40 years on, he is not only still fishing but runs Kernowsashimi, a family business that supplies quality, sustainable fish: familiar species such as haddock, mackerel, whiting, red mullet and crab along with less familiar kinds such as lesser-spotted dogfish, wrasse and gurnard (of the four types, he says, “streaked, which are wider on the shoulders and have soft fins, are the most delicious”), dab and pouting. “You can find a market for anything,” he says. “It’s all protein. And everything has a value.” The idea came from his Japanese daughter-in-law, Mutsuko. “She was the prime mover,” he says, and Mutsuko remains integral to the business, as do his son and daughter. “She said people would pay extra money for fish of the quality we were catching if we sold it into a niche market. My mother said to me if you take fish from the sea and put it on your plate, then you eat it; you don’t waste it. It’s silly to throw things back that might have a market value. So whatever we catch now, we use. We don’t put anything back except for protected species, which we’re legally bound to throw back. About 70 or 80 per cent of the fish comes aboard the boat live so it survives.” He also takes care to use “static gear so we’re not disrupting the substrate or environment”, and large meshes, so they catch only mature fish that have had time to breed. Among the restaurants Kernowsashimi supplies are several in London, notably the two Michelin-star Japanese restaurant Umu in Mayfair, Moshi Moshi, and Riverford at the Duke of Cambridge, in Islington, Britain’s first and only organic pub. Bean has teamed up with the Riverford Field Kitchen and, from January 2015, has been holding a fish masterclass every Friday, to teach people how to cook the fish he caught that day – particularly the less popular species – and to educate them in the ways of sustainable fishing. Highly commended — Catchbox For – its work, as a not-for-profit co-operative or “community supported fishery” run by unpaid volunteers, with small fishermen who use responsible methods to supply individual consumers on England’s South Coast with weekly boxes of fresh, local, responsibly sourced fish. “This is a scheme that cuts out the middle man and puts you, the fish eater, directly in touch with the fishermen in your local harbour,” says The Oceans Award judge Hugh Fearnley-Whittingstall Highly commended — Direct Seafoods For – sourcing fresh fish responsibly and promoting the most sustainable products available. This wholesale seafood and fish supplier also provides comprehensive information on its website relating to the sustainability of fish species. Cornish fisherman Chris Bean was 11 when he built his first boat and decided to go to sea. The son of a cabinetmaker (who helped him draw up the plans), he used to sail it up the Helford River, catching bass and bream. He soon realised there was money to be made from selling his catch to a local fishmonger – “more than from picking potatoes or turnips on a local farm,” he says – and throughout his adolescence this was how he earned his pocket money. The idea came from his Japanese daughter-in-law, Mutsuko. “She was the prime mover,” he says, and Mutsuko remains integral to the business, as do his son and daughter. “She said people would pay extra money for fish of the quality we were catching if we sold it into a niche market. My mother said to me if you take fish from the sea and put it on your plate, then you eat it; you don’t waste it. It’s silly to throw things back that might have a market value. So whatever we catch now, we use. We don’t put anything back except for protected species, which we’re legally bound to throw back. About 70 or 80 per cent of the fish comes aboard the boat live so it survives.” He also takes care to use “static gear so we’re not disrupting the substrate or environment”, and large meshes, so they catch only mature fish that have had time to breed. Among the restaurants Kernowsashimi supplies are several in London, notably the two Michelin-star Japanese restaurant Umu in Mayfair, Moshi Moshi, and Riverford at the Duke of Cambridge, in Islington, Britain’s first and only organic pub. Bean has teamed up with the Riverford Field Kitchen and, from January 2015, has been holding a fish masterclass every Friday, to teach people how to cook the fish he caught that day – particularly the less popular species – and to educate them in the ways of sustainable fishing. For – sourcing fresh fish responsibly and promoting the most sustainable products available. This wholesale seafood and fish supplier also provides comprehensive information on its website relating to the sustainability of fish species. _The Ocean Awards' Projects award sought out the ocean project that has achieved the most in the past year. The winner was the Scottish White Fish Producers Association, which has had a direct impact on the increase of North Sea cod recorded in the International Council for the Exploration of the Sea's stock assessment in 2015. 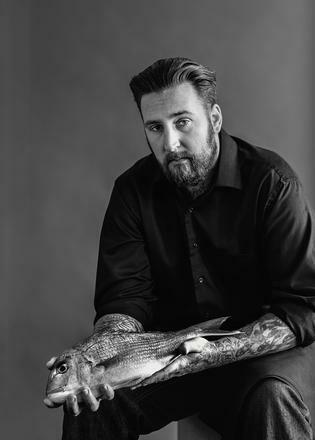 _ “I was at Rockall Bank as a 10 year old with the old line boats,” remembers Mike Park, whose career began as a fisherman but is now chief executive of the Scottish White Fish Producers Association, which represents 170 individual vessels and 1,400 fishers with a collective turnover approaching €200 million. “How my father allowed it, I’m not sure, but I used to go out on boats at weekends and all through the summer holidays. After I left school I became a fisherman, and by 21 I had my first 25 metre trawler and a crew of eight. I was the youngest by 14 years and was expected to deliver by putting money in their pockets.” But fishers know that their livelihood depends on there being fish in the sea. “Remember, ours is a brutal industry,” he continues. “You’re self-employed and you can only make money by being smarter, more ruthless and harder working than the next guy. Our industry is full of alpha males. It’s Darwinian. It’s survival of the fittest. Fishermen don’t necessarily want to be rich but they want to be richer than the guy next to them.” Park therefore takes a pragmatic view of ocean conservation. “The Greens talk about a good environment being built on green credentials. I’ll deliver you the same built on business principles because the two come to the same point.” Since 2010, the Scottish White Fish Producers Association has been remotely monitoring the discarding of cod by means of an onboard electronic system installed on fishing boats. The catch-quota scheme is still under trial and has fed into the recent reform of the EU’s Common Fisheries Policy, but fishers’ willingness to sign up to catch quotas indicates that they are open to pursuing new ways of operating. “If you can remove financial pressures, you remove archaic behaviour. That’s the essence of it,” says Park. The Scottish White Fish Producers Association has also introduced a series of annual, seasonal closures to protect spawning aggregations at various times of the year and has worked to improve nets, promoting the use of those that reduce the capture of cod by 60 per cent. That the Marine Conservation Society removed cod from its list of “fish to avoid” last October is in part thanks to this. Highly commended — Dr Jon Copley Associate professor of marine ecology at the University of Southampton For – launching Exploring Our Oceans, a free six-week interactive online introduction to marine science, the only one of its kind, that has already been taken up by more than 10,000 students from all over the world. Highly commended — Boyan Slat, CEO of The Ocean Cleanup For – his design of a system involving floating barriers to capture plastic debris that has now raised almost $2.2 million towards funding the pilot phase. He hopes the first 2,000 metre system of barriers will be deployed in the Pacific in 2016. Since 2010, the Scottish White Fish Producers Association has been remotely monitoring the discarding of cod by means of an onboard electronic system installed on fishing boats. The catch-quota scheme is still under trial and has fed into the recent reform of the EU’s Common Fisheries Policy, but fishers’ willingness to sign up to catch quotas indicates that they are open to pursuing new ways of operating. “If you can remove financial pressures, you remove archaic behaviour. That’s the essence of it,” says Park. The Scottish White Fish Producers Association has also introduced a series of annual, seasonal closures to protect spawning aggregations at various times of the year and has worked to improve nets, promoting the use of those that reduce the capture of cod by 60 per cent. That the Marine Conservation Society removed cod from its list of “fish to avoid” last October is in part thanks to this. Associate professor of marine ecology at the University of Southampton For – launching Exploring Our Oceans, a free six-week interactive online introduction to marine science, the only one of its kind, that has already been taken up by more than 10,000 students from all over the world. For – his design of a system involving floating barriers to capture plastic debris that has now raised almost $2.2 million towards funding the pilot phase. He hopes the first 2,000 metre system of barriers will be deployed in the Pacific in 2016. _The Policy award has been given to the political or corporate policy that has made the most valuable contribution to solving the global oceans crisis. 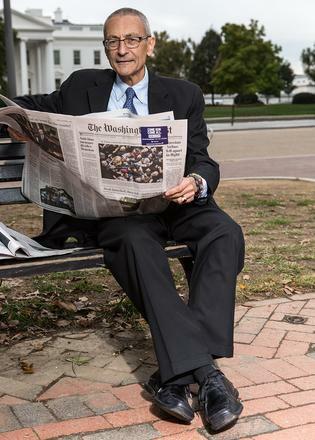 The Ocean Awards winner John D Podesta had an instrumental role in US National Ocean Policy, which included the campaign to expand the Pacific Remote Islands Maritime Monument. _ White House Chief of Staff to Bill Clinton during his presidency and Counsellor to the President under Barack Obama until February 2015, John D Podesta is now chairman of Hillary Clinton’s presidential campaign. The author of several books, among them The Power of Progress: How America’s Progressives Can (Once Again) Save Our Economy, Our Climate and Our Country, he was also instrumental in encouraging President Obama to expand the Pacific Remote Islands National Marine Monument to form one of the largest marine protection areas in the world, ensuring it becomes off-limits to commercial fishing and other resource extraction activities, such as deep-water mining. Other actions listed under the National Ocean Policy plan include the formation and implementation of more Marine Protected Areas, combating black-market fishing, regional marine planning, understanding the impacts of ocean acidification, building resilience in coastal communities and bolstering domestic shellfish aquaculture, all of which should contribute substantially to healthier oceans in which marine species and habitats can thrive. A long-standing champion of responsible stewardship of the seas, he is also a former member of the Joint Ocean Commission Initiative, formed after the release of two high-profile reports on US ocean policy in 2003 and 2004, and the Global Ocean Commission, which he has described as “one of the most dynamic initiatives developing common-sense ways to manage fully 45 per cent of the globe that remains common property, outside any national jurisdiction”. Highly commended — David Cameron, MP for Witney, West Oxfordshire, and Prime Minister of the United Kingdom since 2010 For – the clause in his party’s manifesto, published before the 2015 general election, that included a promise to protect precious marine habitats by creating a Blue Belt of marine reserves around all 14 of the UK’s Overseas Territories and completing the network of Marine Conservation Zones that surround the British coastline. Highly commended — Richard Lochhead, Cabinet Secretary for Rural Affairs, Food and the Environment in the Scottish Government For – putting before the Scottish Parliament a Marine Conservation Order for measures that would ban the highly destructive practice of scallop dredging off the coast of Wester Ross, within the South Arran MPA. White House Chief of Staff to Bill Clinton during his presidency and Counsellor to the President under Barack Obama until February 2015, John D Podesta is now chairman of Hillary Clinton’s presidential campaign. The author of several books, among them The Power of Progress: How America’s Progressives Can (Once Again) Save Our Economy, Our Climate and Our Country, he was also instrumental in encouraging President Obama to expand the Pacific Remote Islands National Marine Monument to form one of the largest marine protection areas in the world, ensuring it becomes off-limits to commercial fishing and other resource extraction activities, such as deep-water mining. Other actions listed under the National Ocean Policy plan include the formation and implementation of more Marine Protected Areas, combating black-market fishing, regional marine planning, understanding the impacts of ocean acidification, building resilience in coastal communities and bolstering domestic shellfish aquaculture, all of which should contribute substantially to healthier oceans in which marine species and habitats can thrive. A long-standing champion of responsible stewardship of the seas, he is also a former member of the Joint Ocean Commission Initiative, formed after the release of two high-profile reports on US ocean policy in 2003 and 2004, and the Global Ocean Commission, which he has described as “one of the most dynamic initiatives developing common-sense ways to manage fully 45 per cent of the globe that remains common property, outside any national jurisdiction”. For – the clause in his party’s manifesto, published before the 2015 general election, that included a promise to protect precious marine habitats by creating a Blue Belt of marine reserves around all 14 of the UK’s Overseas Territories and completing the network of Marine Conservation Zones that surround the British coastline. For – putting before the Scottish Parliament a Marine Conservation Order for measures that would ban the highly destructive practice of scallop dredging off the coast of Wester Ross, within the South Arran MPA. The Personality award at The Oceans Awards goes to the person in the public eye who has done the most to promote awareness of the crisis in the oceans. Best known for the perfectly crafted, incredibly catchy and hugely commercial songs Happy, Get Lucky (with Daft Punk) and, more controversially, Blurred Lines (written and produced for Robin Thicke), all of which have sold several million apiece, Pharrell Williams is also creative director of Bionic Yarn. The company, founded in 2009 by Tyson Toussant and Tim Coombs in New York, produces what it calls “the world’s first high-performance eco yarn”. Using fibres spun from plastic discarded in oceans or collected from shorelines, it creates “fabrics that are as strong as they are soft” by combining them with cotton. Its first collection used 10 tonnes of recycled PET plastic bottles – 700,000 bottles that might otherwise still be at sea, endangering wildlife and marine habitats – to produce jeans and other casual apparel in a collaboration with Dutch fashion brand G-Star RAW. The autumn/winter collection bore the strapline: “Turning the tide on ocean pollution.” Williams’ involvement with Bionic Yarn has enabled the company to partner with several higher-profile brands to spread the message, and it is now in partnership with Timberland, with which it has launched a line of boots made entirely from plastics recovered from the sea, as well as Gap and Cole Haan. “We have a connection with the ocean,” says Williams. “It yields so much life. We owe it.” Highly commended — Helena Bonham Carter, British actress and activist For – stripping off and being photographed naked, hugging a 27kg bigeye tuna, especially when you are, as Bonham Carter puts it, “actually very phobic about fish”. The photograph was picked up by the world’s media and went viral. In short, it achieved exactly what Blue Marine Foundation, which organised the shoot to raise awareness for its campaign to create more marine reserves in the UK Overseas Territories, set out to do. Highly commended — Leonardo DiCaprio, American actor For – belying his screen personae of the doomed steerage passenger in Titanic to Jordan Belfort (whose 1961 superyacht Nadine, originally built for Coco Chanel, sank off Sardinia in 1996) in The Wolf of Wall Street, both of whom didn’t have much luck on the water. But the stellar actor and producer is a committed environmentalist and philanthropist. He has pledged to donate $7 million to ocean conservation projects, urging leaders worldwide to “make ocean viability a priority […] to ensure the health of the oceans that are so vital to people’s lives all around the world”. And last summer the Leonardo DiCaprio Foundation raised $40 million through a gala evening for the preservation of the ocean and environment. The Personality award at The Oceans Awards goes to the person in the public eye who has done the most to promote awareness of the crisis in the oceans. Best known for the perfectly crafted, incredibly catchy and hugely commercial songs Happy, Get Lucky (with Daft Punk) and, more controversially, Blurred Lines (written and produced for Robin Thicke), all of which have sold several million apiece, Pharrell Williams is also creative director of Bionic Yarn. For – stripping off and being photographed naked, hugging a 27kg bigeye tuna, especially when you are, as Bonham Carter puts it, “actually very phobic about fish”. The photograph was picked up by the world’s media and went viral. In short, it achieved exactly what Blue Marine Foundation, which organised the shoot to raise awareness for its campaign to create more marine reserves in the UK Overseas Territories, set out to do. For – belying his screen personae of the doomed steerage passenger in Titanic to Jordan Belfort (whose 1961 superyacht Nadine, originally built for Coco Chanel, sank off Sardinia in 1996) in The Wolf of Wall Street, both of whom didn’t have much luck on the water. But the stellar actor and producer is a committed environmentalist and philanthropist. He has pledged to donate $7 million to ocean conservation projects, urging leaders worldwide to “make ocean viability a priority […] to ensure the health of the oceans that are so vital to people’s lives all around the world”. And last summer the Leonardo DiCaprio Foundation raised $40 million through a gala evening for the preservation of the ocean and environment. _The Ocean Awards has recognised Emily Penn with the FitzRoy Award. Named after the captain of the Beagle, on which Darwin made his famous voyage of discovery to the Galápagos, this award is for the adventurer or explorer who achieved the most to further ocean conservation in the past 12 months. _ The youngest and only female recipient of the RYA Yachtmaster of the Year, awarded by HRH the Princess Royal, Emily Penn describes herself as being “dedicated to studying environmental challenges in the most remote parts of our planet”. As an undergraduate studying architecture at Cambridge University she undertook an “amazing journey” across Russia, Mongolia and China to get to Shanghai to write her dissertation on “the environment and sustainability in architecture and eco cities”. The next year she travelled to Australia, “hitching rides on boats”, crossing the Atlantic, the Caribbean and Pacific, which opened her eyes to the plight of the world’s oceans. “I was seeing the collapse of fisheries, sea level rise, and just could not believe what I was seeing. And not really anything was being done about it.” She is now director of Pangaea Exploration, an organisation with a two-part mission: to strengthen the health of marine life through exploration, conservation and education; and to inspire and develop a new generation of leaders in conservation science, communication, education, art and policy leadership. Among its main concerns are acidification, toxins in the ocean, pollution by plastics and the amount of floating debris in the world’s oceans. “Plastic is entering the ocean at prodigious rates, carrying with it all the threats of both physical and chemical pollution. The debris – toothbrushes, straws, toys, bags and unrefined pre-production material called nurdles – is accumulating all over the world’s beaches and in great concentrations at sea in areas called gyres formed by the great oceanic currents. The Sargasso Sea in the North Atlantic is probably the best known of these for its ability to trap ships. “The team is now on a mission to bring to light the much larger issue across the world’s oceans. We search out areas with higher than normal loads of garbage, as well as trawling a fine mesh net and analysing the plastic content of the trawl. The floating plastic project also includes counting debris on beaches, cataloguing the types of plastics and extrapolating the distance it must have travelled. With this we can estimate the amount of plastics covering the surface of our beaches.” Among the recent expeditions she skippered are two dubbed “eXXpeditions”. In 2014, she took a 14-woman crew across the North Atlantic, from Lanzarote to Martinique, on a 22 metre sailing boat, Sea Dragon, “specifically designed for science”, as part of Jimmy Cornell’s Atlantic Odyssey. Last year they sailed the South Atlantic. “A team of 14 women,” she says, “scientists, activists, designers… but most importantly mothers, sisters, daughters, friends; women who hope for a healthier future.” Highly commended — Lewis Pugh, Endurance swimmer, maritime lawyer, environmental campaigner and UN Environment Programme Patron of the Oceans For – the completion, in February 2015, of five swims in the Antarctic, where the water temperature was -1C and the air temperature -37C. He uses the publicity he attracts to draw attention to the declining health of the world’s oceans and to encourage nations to create Marine Protection Areas. Highly commended — James Delgado, Marine archaeologist and director of maritime heritage for the National Oceanic and Atmospheric Administration For – helping create Marine Protected Areas around shipwrecks such as Titanic, Mary Celeste and, most recently, for persuading the NOAA to increase the size of the Gulf of the Farallones National Marine Sanctuary by more than 250 per cent, and the Cordell Bank National Marine Sanctuary by a similar proportion. The youngest and only female recipient of the RYA Yachtmaster of the Year, awarded by HRH the Princess Royal, Emily Penn describes herself as being “dedicated to studying environmental challenges in the most remote parts of our planet”. 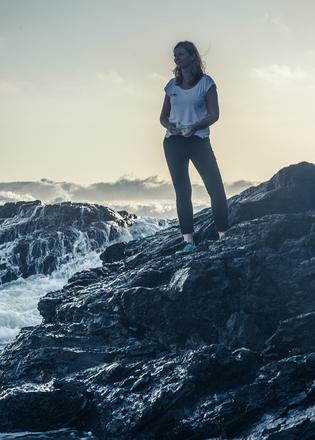 She is now director of Pangaea Exploration, an organisation with a two-part mission: to strengthen the health of marine life through exploration, conservation and education; and to inspire and develop a new generation of leaders in conservation science, communication, education, art and policy leadership. Among its main concerns are acidification, toxins in the ocean, pollution by plastics and the amount of floating debris in the world’s oceans. “Plastic is entering the ocean at prodigious rates, carrying with it all the threats of both physical and chemical pollution. The debris – toothbrushes, straws, toys, bags and unrefined pre-production material called nurdles – is accumulating all over the world’s beaches and in great concentrations at sea in areas called gyres formed by the great oceanic currents. The Sargasso Sea in the North Atlantic is probably the best known of these for its ability to trap ships. For – the completion, in February 2015, of five swims in the Antarctic, where the water temperature was -1C and the air temperature -37C. He uses the publicity he attracts to draw attention to the declining health of the world’s oceans and to encourage nations to create Marine Protection Areas. For – helping create Marine Protected Areas around shipwrecks such as Titanic, Mary Celeste and, most recently, for persuading the NOAA to increase the size of the Gulf of the Farallones National Marine Sanctuary by more than 250 per cent, and the Cordell Bank National Marine Sanctuary by a similar proportion. _The Ocean Awards' Technology award celebrates the new technology or application thereof that has made the biggest contribution to ocean conservation in the past year. Satellite Applications Catapult won the award for its technology system Project Eyes on the Sea. _ “We were looking for areas where space technology could really provide some advantage and it quickly became apparent that the maritime sector was one area where it would have a huge advantage and could be doing much more than it currently is.” So says Stuart Martin, a former vice-chair of UK Space and a council member of Eurospace and now CEO of Satellite Applications Catapult, the UK innovation and technology company created in 2013 to foster growth across the economy through the exploitation of space. Research into which areas might benefit led to a workshop with Pew Charitable Trusts, a Philadelphia-based NGO that has campaigned to end illegal fishing. “So we started thinking how satellites could shine a light on that activity,” says Martin. 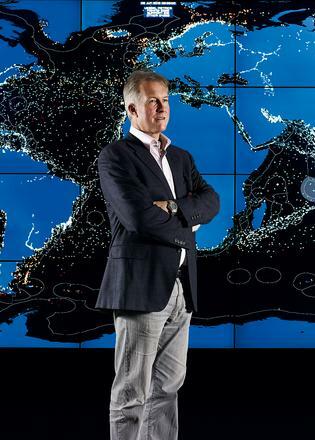 The result is, in the words of one of the Ocean Awards judges, Professor Callum Roberts, “a game-changer in ocean conservation”: a pioneering technology named Eyes on the Seas that can detect illegal fishing via satellites. As Professor Roberts explains: “One of the arguments continually laid at the foot of those campaigning for greater ocean protection is: how can you stop people from fishing in huge and remote areas? And the truth is that until now it was difficult. But with satellite surveillance and monitoring, there is no place for these boats to hide. We can watch them. We can see what they’re doing. We can identify potentially illegal behaviour patterns. We can see when they go into supposedly protected waters; when they move around in a way that suggests they are fishing. And when something signals suspicious behaviour, you can focus in on that vessel, follow it around, and when it next comes into port, you can nail it.” It is also, he points out, a much less expensive and more efficient way of patrolling the ocean than using boats. As Martin adds: “It supports nation states, it supports enforcement agencies, fishing vessels that are trying to behave legally and the supermarkets and supply-chain companies so that they can have better assurance on where the produce they are buying comes from. We’re at the stage where we are doing live trials and will be moving to operation next year.” Industrial-scale pirate fishers won’t know they are under surveillance, but they will be. Highly commended — Schmidt Ocean Institute For – its project in the remote Timor Sea, where some of the healthiest coral reefs in the world continue to thrive. By combining the use of a high-performance supercomputer, the first of its kind on a research vessel, with remote-sensing technologies, it was able to examine how fine-scale oceanographic processes drive the connectivity and productivity of these reefs, so enabling a greater understanding of the ecological processes that shape coral reef communities and identifying the habitats most likely to be sensitive to disturbances such as bleaching. Highly commended — Smartfin For – enabling surfers to collect data to understand better the effects of climate change on coastal systems. Founded by Dr Andrew Stern, a retired neurologist, Smartfin is a surfboard fin with sensors that measures multiple ocean parameters including salinity, pH, temperature, location and wave characteristics. “We were looking for areas where space technology could really provide some advantage and it quickly became apparent that the maritime sector was one area where it would have a huge advantage and could be doing much more than it currently is.” So says Stuart Martin, a former vice-chair of UK Space and a council member of Eurospace and now CEO of Satellite Applications Catapult, the UK innovation and technology company created in 2013 to foster growth across the economy through the exploitation of space. Research into which areas might benefit led to a workshop with Pew Charitable Trusts, a Philadelphia-based NGO that has campaigned to end illegal fishing. “So we started thinking how satellites could shine a light on that activity,” says Martin. The result is, in the words of one of the Ocean Awards judges, Professor Callum Roberts, “a game-changer in ocean conservation”: a pioneering technology named Eyes on the Seas that can detect illegal fishing via satellites. As Professor Roberts explains: “One of the arguments continually laid at the foot of those campaigning for greater ocean protection is: how can you stop people from fishing in huge and remote areas? And the truth is that until now it was difficult. But with satellite surveillance and monitoring, there is no place for these boats to hide. We can watch them. We can see what they’re doing. We can identify potentially illegal behaviour patterns. We can see when they go into supposedly protected waters; when they move around in a way that suggests they are fishing. And when something signals suspicious behaviour, you can focus in on that vessel, follow it around, and when it next comes into port, you can nail it.” It is also, he points out, a much less expensive and more efficient way of patrolling the ocean than using boats. As Martin adds: “It supports nation states, it supports enforcement agencies, fishing vessels that are trying to behave legally and the supermarkets and supply-chain companies so that they can have better assurance on where the produce they are buying comes from. We’re at the stage where we are doing live trials and will be moving to operation next year.” Industrial-scale pirate fishers won’t know they are under surveillance, but they will be. For – its project in the remote Timor Sea, where some of the healthiest coral reefs in the world continue to thrive. By combining the use of a high-performance supercomputer, the first of its kind on a research vessel, with remote-sensing technologies, it was able to examine how fine-scale oceanographic processes drive the connectivity and productivity of these reefs, so enabling a greater understanding of the ecological processes that shape coral reef communities and identifying the habitats most likely to be sensitive to disturbances such as bleaching. For – enabling surfers to collect data to understand better the effects of climate change on coastal systems. Founded by Dr Andrew Stern, a retired neurologist, Smartfin is a surfboard fin with sensors that measures multiple ocean parameters including salinity, pH, temperature, location and wave characteristics. The Science award is given to the scientific work or paper that made the most original, important or insightful contribution to ocean conservation in the past year. Dr Andrea Marshall and Guy Stevens are winners at The Ocean Awards because their research led to the listing of reef mantas on the Convention of Migratory _Species and the Convention on International Trade in Endangered Species._ Of the 5,600 or so species of animal protected by the Convention on International Trade in Endangered Species of Wild Fauna and Flora, known more commonly as CITES, only just over 100 are fish. Two are species of manta ray: Manta birostris, which can grow to be eight metres wide; and the smaller reef manta ray, Manta alfredi. Their protection is, in most part, thanks to petitioning by the US-based Marine Megafauna Foundation, founded by the marine biologist Dr Andrea Marshall, and the Manta Trust, founded by the British-born marine biologist Guy Stevens. Marshall’s research team has worked for years to highlight the vulnerability of these animals: their low reproductive rates, small population sizes and quick population collapses. Establishing the first global online database, called Manta Matcher, enabled scuba divers around the world to report encounters with mantas and post identification photographs, which allowed researchers to track their movements and lifespans. Combining this “citizen science” collected data with information from advanced satellite tags, researchers were able to show how far and often these rays migrate into unprotected waters – further evidence of their grave situation. This information was used in recent years to list both species of manta on the appendices of the Convention of Migratory Species, but it was a listing on CITES that was the critical step needed to end the unregulated trade in these species to China. “As conservation biologists, all we can hope for is that our research has a tangible impact on conservation,” Marshall says. “The CITES listing was the culmination of a decade of hard work to gain more protection for these incredible species. It was the single most important conservation win for manta rays in history and we are overjoyed by the achievement.” “It was a wonderful win to put manta rays on the CITES list,” says Professor Callum Roberts, one of the judges of this year’s Ocean Awards. “They made the case cogently and very convincingly that exploitation of manta rays was not sustainable and would endanger them with extinction.” “There were two areas that needed to be tackled,” Marshall explains. “My team did the research and field work behind the ecology, the migrations, the biological detail and the threat that mantas face as a species, while Guy’s team really focused on the Asian trade, what it was worth, the fisheries side of things.” Stevens adds: “Manta gill plates are used in Chinese medicine and the trade in that is causing these animals to decline in certain areas. By having them listed on CITES, we can regulate that trade and hopefully stop it. “In the grand scheme of things manta rays aren’t worth a huge amount to the nations that are fishing for them,” he continues. “If you’re going to throw a bone to the conservation world, giving them manta rays is not a particularly painful thing to do in terms of economic loss.” It terms of its value to the marine environment, and the world as a whole, though, this move to conserve manta populations is immeasurable. Highly commended — M Aaron MacNeil, Nicholas AJ Graham, Joshua E Cinner, Shaun K Wilson, Ivor D Williams, Joseph Maina, Steven Newman, Alan M Friedlander, Stacy Jupiter, Nicholas VC Polunin and Tim R McClanahan For — their paper “Recovery potential of the world’s coral reef fishes”, February 2015. Published in the journal Nature, researchers from Australia, the UK and the US examined more than 800 reefs in 64 locations around the world and found that 83 per cent of fished reefs now have less than half the number of fish they were expected to have. Their findings have been used to develop the first benchmarks for the recovery potential of fished reefs. Highly commended — Douglas J McCauley, Malin L Pinsky, Stephen R Palumbi, James A Estes, Francis H Joyce, Robert R Warner For — their paper “Marine defaunation: Animal loss in the global ocean”, January 2015. Marine scientists from the University of California, Stanford University and the Institute of Marine and Coastal Sciences at Rutgers University, New Jersey, compared loss of marine animal populations with endangered terrestrial species and found that marine fauna are generally in better condition than terrestrial fauna. They conclude that, with careful stewardship, the rehabilitation of affected marine animal populations remains possible. Of the 5,600 or so species of animal protected by the Convention on International Trade in Endangered Species of Wild Fauna and Flora, known more commonly as CITES, only just over 100 are fish. Two are species of manta ray: Manta birostris, which can grow to be eight metres wide; and the smaller reef manta ray, Manta alfredi. Their protection is, in most part, thanks to petitioning by the US-based Marine Megafauna Foundation, founded by the marine biologist Dr Andrea Marshall, and the Manta Trust, founded by the British-born marine biologist Guy Stevens. Marshall’s research team has worked for years to highlight the vulnerability of these animals: their low reproductive rates, small population sizes and quick population collapses. Establishing the first global online database, called Manta Matcher, enabled scuba divers around the world to report encounters with mantas and post identification photographs, which allowed researchers to track their movements and lifespans. Combining this “citizen science” collected data with information from advanced satellite tags, researchers were able to show how far and often these rays migrate into unprotected waters – further evidence of their grave situation. This information was used in recent years to list both species of manta on the appendices of the Convention of Migratory Species, but it was a listing on CITES that was the critical step needed to end the unregulated trade in these species to China. Stevens adds: “Manta gill plates are used in Chinese medicine and the trade in that is causing these animals to decline in certain areas. By having them listed on CITES, we can regulate that trade and hopefully stop it. “In the grand scheme of things manta rays aren’t worth a huge amount to the nations that are fishing for them,” he continues. “If you’re going to throw a bone to the conservation world, giving them manta rays is not a particularly painful thing to do in terms of economic loss.” It terms of its value to the marine environment, and the world as a whole, though, this move to conserve manta populations is immeasurable. 83 per cent of fished reefs now have less than half the number of fish they were expected to have. Their findings have been used to develop the first benchmarks for the recovery potential of fished reefs. For — their paper “Marine defaunation: Animal loss in the global ocean”, January 2015. Marine scientists from the University of California, Stanford University and the Institute of Marine and Coastal Sciences at Rutgers University, New Jersey, compared loss of marine animal populations with endangered terrestrial species and found that marine fauna are generally in better condition than terrestrial fauna. They conclude that, with careful stewardship, the rehabilitation of affected marine animal populations remains possible. The Ocean Awards' Restaurateur/Chef award celebrates the restaurant group, chef or restaurateur who has made the most outstanding commitment to ocean conservation. 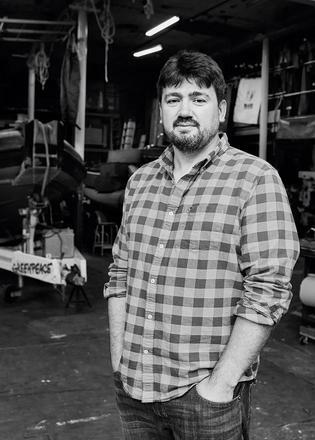 Rob Ruiz, sushi chef and owner of the Land & Water Company, is the winner for his his campaign to conserve the endangered vaquita porpoise in the Gulf of California and to promote the use of shrimp caught without the use of entangling gillnets. Born and raised in Oceanside, California, and a graduate of the University of Hawaii, where he honed his culinary skills, Rob Ruiz is one of the best sushi chefs in San Diego. He is also committed to the sustainability of the fish he serves and to the whole marine environment, hence his project to conserve the vaquita porpoise that get caught in gillnets. “Our fishing practices have such a negative impact,” he says. “At first I didn’t know that I was contributing to the problem by serving shrimp from the Gulf so now I’m doing everything I can to fix that.” The vaquita is “to Mexico like the panda is to China”, he says. “It is facing extinction as a result of being caught in the gillnets used to catch shrimp in the Gulf of California, which is then imported into the US.” Rob has been working with scientists from the Southwest Fisheries Science Centre, part of the National Oceanic and Atmospheric Administration, the federal agency responsible for the condition of the oceans and the atmosphere, the Mexican government and NGOs such as the World Wildlife Fund Mexico and Pro-Natura, as well as directly with fishermen to try to encourage them to use gear that would not endanger the vaquita. In April 2015, President Enrique Peña Nieto of Mexico banned the use of gillnets from the northern Gulf of California until April 2017, during which time fishermen will be encouraged to learn to fish by other, more vaquita-friendly means. His concern is that it may be too late. “There are only close to 70 individual creatures left and, of those, probably only half are female, so there is also the question of whether there is enough genetic diversity left in their gene pool for them to propagate and repopulate the species now that we have the gillnet ban,” he says. “So we need people to know about the issue and understand the problem. And we have to find a way to educate the fishermen.” To this end Ruiz has also raised tens of thousands of dollars by holding events at the restaurant in aid of vaquita conservation. It goes without saying that the fish he serves at the Land & Water Company is sustainable, favouring, for instance, octopus that has been diver-caught in Spanish waters, line-caught albacore tuna from Hawaii and Selva shrimp, the first shrimp product to receive the green “Best Choice” recommendation from Monterey Bay Aquarium. Highly commended — Caroline Bennett, Former fund manager and founder of restaurant Moshi Moshi For — her campaigns to protect fish stocks and encourage consumers to eat under-used parts of fish in an effort to reduce waste. Highly commended — McDonald’s, Global fast food chain For — its work to ensure that the hake or pollock in a Filet-O-Fish or McFish sandwich comes from a fishery certified by the Marine Stewardship Council. Its restaurants in 39 European countries, the US and Canada already display the blue MSC label. The Ocean Awards' Restaurateur/Chef award celebrates the restaurant group, chef or restaurateur who has made the most outstanding commitment to ocean conservation. Rob Ruiz, sushi chef and owner of the Land & Water Company, is the winner for his his campaign to conserve the endangered vaquita porpoise in the Gulf of California and to promote the use of shrimp caught without the use of entangling gillnets. Rob has been working with scientists from the Southwest Fisheries Science Centre, part of the National Oceanic and Atmospheric Administration, the federal agency responsible for the condition of the oceans and the atmosphere, the Mexican government and NGOs such as the World Wildlife Fund Mexico and Pro-Natura, as well as directly with fishermen to try to encourage them to use gear that would not endanger the vaquita. In April 2015, President Enrique Peña Nieto of Mexico banned the use of gillnets from the northern Gulf of California until April 2017, during which time fishermen will be encouraged to learn to fish by other, more vaquita-friendly means. To this end Ruiz has also raised tens of thousands of dollars by holding events at the restaurant in aid of vaquita conservation. It goes without saying that the fish he serves at the Land & Water Company is sustainable, favouring, for instance, octopus that has been diver-caught in Spanish waters, line-caught albacore tuna from Hawaii and Selva shrimp, the first shrimp product to receive the green “Best Choice” recommendation from Monterey Bay Aquarium. For — her campaigns to protect fish stocks and encourage consumers to eat under-used parts of fish in an effort to reduce waste. For — its work to ensure that the hake or pollock in a Filet-O-Fish or McFish sandwich comes from a fishery certified by the Marine Stewardship Council. Its restaurants in 39 European countries, the US and Canada already display the blue MSC label. The Corporate and Social Responsibility award is for the company that has done the most to address ocean conservation, whether through sustainability issues or addressing pollution threats, such as plastics. Selfridges is a winner at The Ocean Awards because of its Project Ocean initiative, which last year removed _single-use plastic bottles from its food halls and restaurants._ Since its launch in 2011, Project Ocean, a collaboration between the British department store Selfridges and the Zoological Society of London, has campaigned on a range of marine-themed issues: from not eating endangered fish to the need for more reserves. In 2015, however, it focused on raising awareness of these issues and driving change to reduce the amount of plastic waste we casually discard. 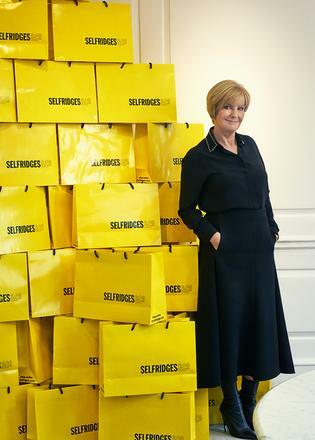 Last summer Selfridges staged an exhibition in its Ultralounge, curated by Jane Withers, that invited shoppers to “imagine life without the plastic water bottle”. It drew attention to the fact that almost 400 million tonnes of plastic are produced globally each year – only about 10 per cent of which is recycled – and that eight million tonnes of plastic are dumped each year in the ocean, accounting for up to 80 per cent of marine debris. This creates immense concentrations of potentially toxic plastic waste formed by the gyres (systems of rotating currents) now at large in the world’s oceans. Indeed, within the next decade the ratio of fish to plastic in the world’s oceans is expected to be about 3:1. Among several arresting, specially commissioned installations was a collection of objects named Gyrecraft, made from plastic recovered from the North Atlantic, designed by Studio Swine, including a replica of the 22 metre research vessel from which they harvested the plastic waste. Within the “ship”, visitors were able to listen to recordings explaining what happens to plankton when they ingest the plastic, and by extension what happens to other marine species when they do the same. It is therefore a problem that extends all the way up the food chain. “Customer awareness of Project Ocean has been significant,” says Pitcher. “In terms of changing customer perceptions, 80 per cent of those polled said that it made them think about the issues,” whether it was buying fewer single-use plastic bottles, recycling more, donating money or simply spreading the word. For Selfridges, Project Ocean is part of what Pitcher describes as “buying better, inspiring change: an approach to sustainable business that inspires people, partners and customers to respect the environment, buy responsibly and champion sustainable products that contribute to healthy and happy communities”. Highly commended — Unilever For — phasing out, by 1 January 2015, its use of plastic microbeads/micro-plastics in its personal care products worldwide by using suitable alternatives. Highly commended — The Economist For — hosting, in June 2015, its third World Ocean Summit, attended by 350 government ministers, business leaders and environmentalists from all over the world, to discuss how to move from a conventional ocean economy to a “blue” economy. It also ran the Ocean Innovation Challenge, an initiative that called for solutions to alleviate the tension between growth and sustainability in the oceans. campaigned on a range of marine-themed issues: from not eating endangered fish to the need for more reserves. In 2015, however, it focused on raising awareness of these issues and driving change to reduce the amount of plastic waste we casually discard. Last summer Selfridges staged an exhibition in its Ultralounge, curated by Jane Withers, that invited shoppers to “imagine life without the plastic water bottle”. It drew attention to the fact that almost 400 million tonnes of plastic are produced globally each year – only about 10 per cent of which is recycled – and that eight million tonnes of plastic are dumped each year in the ocean, accounting for up to 80 per cent of marine debris. This creates immense concentrations of potentially toxic plastic waste formed by the gyres (systems of rotating currents) now at large in the world’s oceans. Indeed, within the next decade the ratio of fish to plastic in the world’s oceans is expected to be about 3:1. Among several arresting, specially commissioned installations was a collection of objects named Gyrecraft, made from plastic recovered from the North Atlantic, designed by Studio Swine, including a replica of the 22 metre research vessel from which they harvested the plastic waste. Within the “ship”, visitors were able to listen to recordings explaining what happens to plankton when they ingest the plastic, and by extension what happens to other marine species when they do the same. It is therefore a problem that extends all the way up the food chain. “Customer awareness of Project Ocean has been significant,” says Pitcher. “In terms of changing customer perceptions, 80 per cent of those polled said that it made them think about the issues,” whether it was buying fewer single-use plastic bottles, recycling more, donating money or simply spreading the word. For Selfridges, Project Ocean is part of what Pitcher describes as “buying better, inspiring change: an approach to sustainable business that inspires people, partners and customers to respect the environment, buy responsibly and champion sustainable products that contribute to healthy and happy communities”. For — phasing out, by 1 January 2015, its use of plastic microbeads/micro-plastics in its personal care products worldwide by using suitable alternatives. For — hosting, in June 2015, its third World Ocean Summit, attended by 350 government ministers, business leaders and environmentalists from all over the world, to discuss how to move from a conventional ocean economy to a “blue” economy. It also ran the Ocean Innovation Challenge, an initiative that called for solutions to alleviate the tension between growth and sustainability in the oceans. 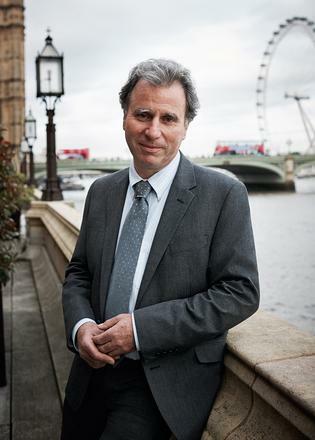 _Oliver Letwin, MP for West Dorset and Chancellor of the Duchy of Lancaster, has won the Visionary award because the judges felt he was the politician or thinker who had achieved the most for ocean conservation in the last year. It's his work to commit the British Government to the creation of a Marine Protection Area around Pitcairn, and to the creation of “Blue Belts” around the 14 UK Overseas Territories, that makes him a winner at The Ocean Awards. _ On 10 September 2014, Zac Goldsmith MP, Stanley Johnson, the RSPB, Blue Marine Foundation and Pew Trusts presented Parliament with a pamphlet calling on the Government to commit to creating Marine Protected Areas around three of its Overseas Territories: Pitcairn, Ascension, and South Georgia and the South Sandwich Islands. Outstanding among the politicians who supported the move and led the push towards the creation of a new MPA around Pitcairn in the southern Pacific was the Rt Hon Oliver Letwin MP, the Conservative member for West Dorset and Chancellor of the Duchy of Lancaster. This led to its inclusion of a commitment to create a “Blue Belt around the UK’s 14 Overseas Territories, subject to local support and environmental need [and] designate a further protected area at Ascension Island, subject to the views of the local community. [While] off our own coasts we will complete the network of Marine Conservation Zones that we have already started, to create a UK Blue Belt of protected sites.” This formed part of the Conservative Party manifesto, published before the May 2015 general election. When fully implemented, the Pitcairn MPA will be the largest in the world. The waters around the Pitcairn Islands are home to some of the best-preserved marine ecosystems on the planet and are of globally significant biological value. More than 1,200 marine species have been recorded around the islands, including whales, dolphins, fish, turtles, seabirds and corals. Of these species, 48 are globally threatened, including the hawksbill turtle and the Pitcairn angelfish, which is found almost nowhere else. Highly commended — Zac Goldsmith, MP for Richmond Park and North Kingston For — his campaign, going back to when he was elected in 2010, for Pitcairn to become a Marine Protected Area. Highly commended — Dr Sylvia Earle, Oceanographer and founder of Deep Ocean Exploration and **Research, SEAlliance and Mission Blue** For — her efforts to increase the proportion of protected water from less than 3 per cent today to 20 per cent by 2020. On 10 September 2014, Zac Goldsmith MP, Stanley Johnson, the RSPB, Blue Marine Foundation and Pew Trusts presented Parliament with a pamphlet calling on the Government to commit to creating Marine Protected Areas around three of its Overseas Territories: Pitcairn, Ascension, and South Georgia and the South Sandwich Islands. Outstanding among the politicians who supported the move and led the push towards the creation of a new MPA around Pitcairn in the southern Pacific was the Rt Hon Oliver Letwin MP, the Conservative member for West Dorset and Chancellor of the Duchy of Lancaster. This led to its inclusion of a commitment to create a “Blue Belt around the UK’s 14 Overseas Territories, subject to local support and environmental need [and] designate a further protected area at Ascension Island, subject to the views of the local community. [While] off our own coasts we will complete the network of Marine Conservation Zones that we have already started, to create a UK Blue Belt of protected sites.” This formed part of the Conservative Party manifesto, published before the May 2015 general election. When fully implemented, the Pitcairn MPA will be the largest in the world. The waters around the Pitcairn Islands are home to some of the best-preserved marine ecosystems on the planet and are of globally significant biological value. More than 1,200 marine species have been recorded around the islands, including whales, dolphins, fish, turtles, seabirds and corals. Of these species, 48 are globally threatened, including the hawksbill turtle and the Pitcairn angelfish, which is found almost nowhere else. For — his campaign, going back to when he was elected in 2010, for Pitcairn to become a Marine Protected Area. For — her efforts to increase the proportion of protected water from less than 3 per cent today to 20 per cent by 2020. The Ocean Awards' UK retailer award is given to the retailer that has done the most through corporate policy and/or public engagement to address ocean issues in the past year. Marks & Spencer won for its Forever Fish campaign, part of Plan A 2020. 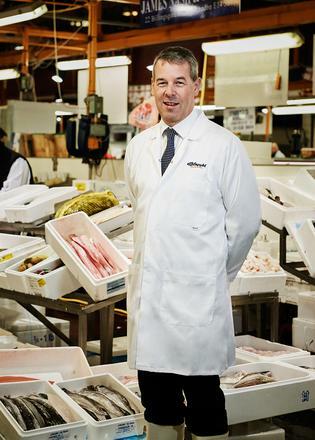 “We’ve had a responsible fishing policy for the past 15 years and we’ve taken that even further with our Forever Fish campaign,” says Paul Willgoss, director of food technology at the British multinational retailer. In 2007 it launched a project called Plan A (“because there is no plan B”), subsequently relaunched as Plan A 2020, setting out a 100-point plan of environmental and ethical goals. For example, it started charging for plastic carrier bags in 2008, a full seven years before the Government introduced a compulsory charge last October. What profits are generated from the sale of its carrier bags – the aim of the initiative is to discourage their use – are donated to the World Wildlife Fund, the Marine Conservation Society and an education programme to protect the marine environment. Among its ethical policies is the Forever Fish campaign, which has three principal objectives: “to help to protect and save our precious sea life, oceans and beaches for future generations to enjoy; to encourage eating of lesser-known and British fish species, without compromising on quality; and to involve volunteers in cleaning our beaches and teaching their children about fish.” To this end it organises a twice-yearly beach clean-up, encouraging volunteers to record data on the types and amounts of litter. In June 2014 the clean-up involved 8,000 volunteers clearing more than 25 tonnes of rubbish from 135 beaches and canals across the UK. The next year an even more impressive 40 tonnes of detritus was removed from 90 beaches and 42 waterways by 6,000 volunteers. Subsequent analysis revealed a 50 per cent increase year-on-year in the number of discarded wet wipes found on beaches. In addition, M&S funds four initiatives through this campaign: the WWF Rumaki programme, which challenges unsustainable fishing practices in East Africa; a WWF project in Fiji to conserve turtles on the Great Sea Reef; the WWF’s PISCES project (PISCES stands for Partnerships Involving Stakeholders in the Celtic Sea Ecosystem); and a low-impact brown crab fishery in Orkney. Highly commended — Sainsbury’s For – celebrating its fourth Switch the Fish Day by giving away five tonnes of less popular types of fish in the hope that, on trying them, customers might be inspired to buy species other than the perennial bestsellers: cod, salmon, haddock, tuna and prawns. This is all part of its 20x20 Sustainability Plan, which aims to have all the fish it sells independently certified as sustainable by 2020. Highly commended — Waitrose For – its continued efforts, over more than 15 years, to source its seafood responsibly, using only suppliers with fisheries or farmed aquaculture operations that are responsibly managed. By 2017, it pledges, all the fish it sells will be independently certified as responsibly sourced, to assure customers that what they are buying is not at risk as a species. The Ocean Awards' UK retailer award is given to the retailer that has done the most through corporate policy and/or public engagement to address ocean issues in the past year. Marks & Spencer won for its Forever Fish campaign, part of Plan A 2020.
last October. What profits are generated from the sale of its carrier bags – the aim of the initiative is to discourage their use – are donated to the World Wildlife Fund, the Marine Conservation Society and an education programme to protect the marine environment. To this end it organises a twice-yearly beach clean-up, encouraging volunteers to record data on the types and amounts of litter. In June 2014 the clean-up involved 8,000 volunteers clearing more than 25 tonnes of rubbish from 135 beaches and canals across the UK. The next year an even more impressive 40 tonnes of detritus was removed from 90 beaches and 42 waterways by 6,000 volunteers. Subsequent analysis revealed a 50 per cent increase year-on-year in the number of discarded wet wipes found on beaches. In addition, M&S funds four initiatives through this campaign: the WWF Rumaki programme, which challenges unsustainable fishing practices in East Africa; a WWF project in Fiji to conserve turtles on the Great Sea Reef; the WWF’s PISCES project (PISCES stands for Partnerships Involving Stakeholders in the Celtic Sea Ecosystem); and a low-impact brown crab fishery in Orkney. For – celebrating its fourth Switch the Fish Day by giving away five tonnes of less popular types of fish in the hope that, on trying them, customers might be inspired to buy species other than the perennial bestsellers: cod, salmon, haddock, tuna and prawns. This is all part of its 20x20 Sustainability Plan, which aims to have all the fish it sells independently certified as sustainable by 2020. For – its continued efforts, over more than 15 years, to source its seafood responsibly, using only suppliers with fisheries or farmed aquaculture operations that are responsibly managed. By 2017, it pledges, all the fish it sells will be independently certified as responsibly sourced, to assure customers that what they are buying is not at risk as a species. At home and overseas, Greenpeace UK’s oceans team has successfully campaigned on a number of key issues over the past year. In Australia, it deterred investors from funding a mega-mine that threatened to cause devastation to part of the Great Barrier Reef. In the Pacific, the campaign to save the vaquita, the world’s most endangered cetacean, helped mobilise international pressure to implement a ban on the use of gillnets. And through a combination of political lobbying, legal challenges and investigative work, “we’ve been able to give a big voice to small-scale fishers”, says Willie Mackenzie, Greenpeace UK’s longstanding oceans campaigner, not least in securing far-reaching reform of Europe’s fisheries laws that will benefit both marine ecosystems and the coastal communities that depend on them for their livelihoods. Mackenzie is quick to acknowledge, however, that Greenpeace’s successes depend on collaborations and coalitions he and his fellow campaigners forge with other NGOs and marine organisations, and campaigns such as Selfridges’ Project Ocean, the BBC’s Big Blue Live and Hugh Fearnley-Whittingstall’s Hugh’s Fish Fight. As to the difference Greenpeace UK is making globally, he points to its efforts to clean up the tuna industry. “We have a lot of different abilities,” Mackenzie says, “intervening at all stages of the supply chain. For example, we can be under cover on the boats, tackling overfishing; and under cover in processing plants. We can be in the market place looking at what’s on supermarket shelves, holding retailers and brands to account. We’ve got all the big UK supermarket chains sourcing their tuna sustainably now. 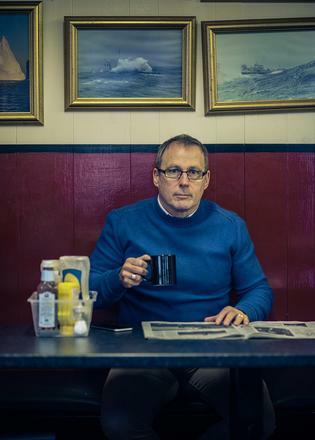 “It’s a matter of getting the people providing the fish to do the right thing. I think we’ve really turned the corner on that in the UK. There was a time when they didn’t seem to understand that frozen fish and canned fish were also fish. But now the major supermarkets are falling over themselves to be seen as being as good as possible. Even companies like Tesco, which has had a lot of bad press, are way ahead [compared with a lot of their international peers]”.